strict warning: Declaration of views_handler_filter_term_node_tid::value_validate() should be compatible with views_handler_filter::value_validate($form, &$form_state) in /home/dr_rick/onearmedman.com/modules/views/modules/taxonomy/views_handler_filter_term_node_tid.inc on line 0.
strict warning: Declaration of views_plugin_style_default::options() should be compatible with views_object::options() in /home/dr_rick/onearmedman.com/modules/views/plugins/views_plugin_style_default.inc on line 0. If you've read my swineflu analysis, some of this should make sense. I ran a search on '#iranelection OR Tehran OR Ahmadinejad OR Mousavi' in Twitter for the period between Friday and Sunday evening. From the 79,957 results I got back, below is some graph analysis of what came out. 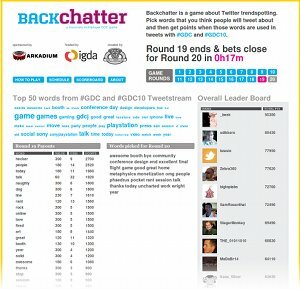 Here is the latest in my continuing series on analyzing Twitter conference backchannels by their hashtags and replies/retweets. This one, though, is a bit different and special... because I was actually at the conference! Below is my breakdown of Games + Learning + Society 2009 via the #gls and #gls09 hashtags. Because I've recently been... let's just come out and say obsessed with looking at the social relationships that seem to emerge from examining sociograms of Twitter users within the "channel" of a particular hashtag, here's another one I thought was interesting: Media in Transition 6, a.k.a. #mit6. I just did a run on the first two days of the 2009 Nonprofit Technology Conference using the tools I've been working on (see my post on #swineflu earlier this week.) Using the hashtag #09ntc, I parsed 3834 tweets, and I looked up the hubs and authorities, plus generated the graph of the largest strongly connected component within the larger directed graph created from all the "@" replies and retweets.